Highly durable and one of the brightest whites you’ll find in tile, the Finesse collection has multiple sizes and shapes to suit just about any ceramic wall tile project. This smooth, glossy 3 in. x 6 in. subway tile is perfect for backsplashes and feature walls in the kitchen, bathroom, shower and more. It’s a classic tile in a pure white color that is hard to find. 12.5 square feet, 100 pieces per case. Case weight is 36.74 lb. 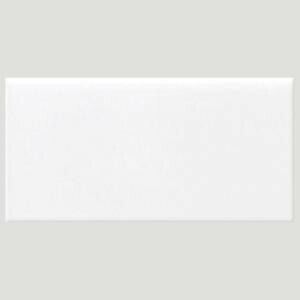 Buy online Daltile Finesse Bright White 3 in. x 6 in. Ceramic Wall Tile (12.5 sq. ft. / case) FE0136HD1P, leave review and share Your friends.